(MA, RI, CT, VT, NH, ME). SecurityWorks serves as a complete perimeter security contractor, managing every aspect of our customers’ perimeter security projects. In addition to site work and fence and gate installation, our expert technicians also handle electrical wiring as well as the installation and programming of access controls. 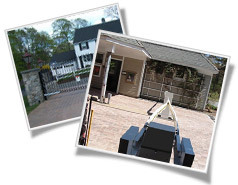 As licensed electrical contractors in the state of Massachusetts (License #MA 1609 C) and licensed fence contractors in Boston (B19084), we provide innovative perimeter security solutions to all of our commercial and residential customers. We are affiliated with the American Fence Association (AFA), International Door Association (IDA) and the International Fence Industry Association (IFIA). Our commitment to customer satisfaction extends to our dedicated service department, which provides you with the peace of mind that comes with 24/7 service and repair. Whether you require standard maintenance or an emergency repair, our experienced service technicians respond quickly to maintain the security of your business or residence. Please contact us today to enhance the perimeter security of your commercial or residential property with our wide array of fence, gate and access control products.